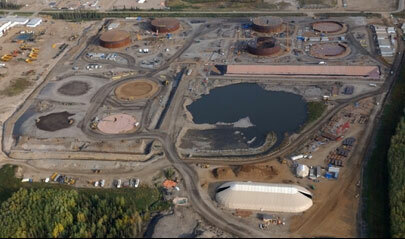 PROJECT OWNER: Suncor Energy Inc.
Carmacks Industrial Division was awarded the contract for earthwork at the Suncor East Tank Farm project just outside of the Suncor Oil Sands main site north of Fort McMurray, Alberta. The East Tank Farm consists of 10 containment tanks and Carmacks participated in the construction of the first of three phases in order to get this site in complete operation. The scope of work consisted of all earthwork construction with the largest portion of the project being the re-construction of the previously failed retention pond. In addition to the retention pond Carmacks constructed all site roads (both temporary and permanent) around the site as well as the installation of a Polyurea containment liner and dykes around the hot bitumen tanks on the west side of the site. Carmacks was also responsible for all site grading, drainage and pad construction around the site. As a part of the East Tank Farm Project, Carmacks was awarded an additional scope of work to excavate, bed and backfill two 1.3km pipeline trenches (OSBL Pipeline) in order to supply the East Tank Farm for operation. This additional work started in September 2012 and was completed in February of 2013.